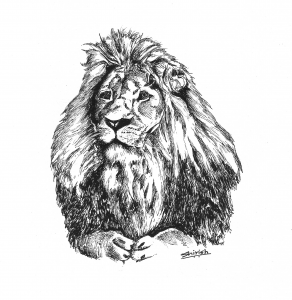 Did this lion pen sketch a couple of days ago off a reference pic shared by a friend. Yesterday I took a stroll with my sketchbook in my hand post lunch. I came across this tiny temple, not more than 6-7 feet in height. It was nestled in a banyan tree, and even some banyan tree roots had penetrated the marble of the temple. 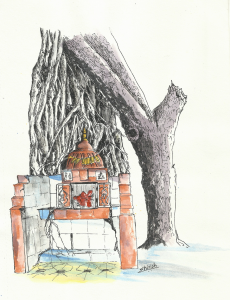 As I started rapidly sketching the temple stading on the footpath, the caretaker Mr Jagtap arrived and offered me to come inside and sketch. Since he did not have a chair, he made a makeshift one for me using few planks and made me sit comfortably. He showed me his sketchbook. 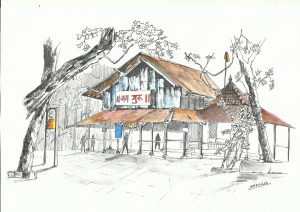 Today morning sketch with Pune Urban Sketchers at Jangali Maharaj temple, Pune. It’s a very old temple in Pune (late nineteenth century), named after a saint and freedom fighter, Sadguru Jangali Maharaj. Did a series of nudes as prep for figurative paintings I will be doing in next few months. All done with 5B pencil. A serene sunny day, cool breeze from the emerald sea, waves lapping at distant rocks, and a flock of birds flying on the wind. A picture perfect setting! 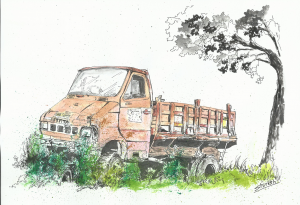 I was driving down the Yerawada area few days ago, when I came across this old truck parked at the roadside. I quickly captured few snaps and drew this today. Pen, inks, watercolors on paper. 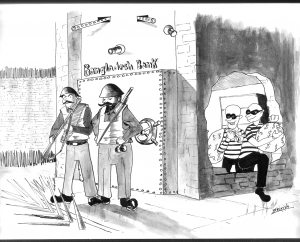 Did this little cartoon on the Bangladesh bank robbery incidence. 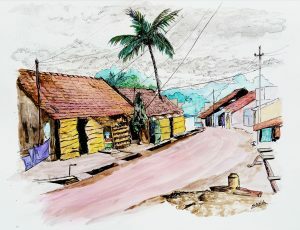 Drew this pen, inks and watercolor sketch from a photo shared by a friend. He had clicked it on one of his travels. 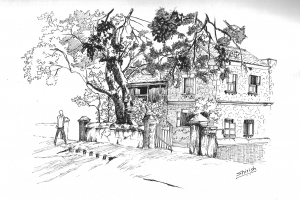 Prabhat road in Pune is home to many beautiful houses and bungalows made from stones and shingles. Though many of them are succumbing to modern high rises, this one still stands proud among lush greenery. I clicked a photo of this one while passing by some weeks ago, and here it is, rendered using technical pens and (a tiny little bit of) black brush pen. 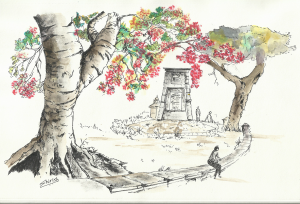 Gulmohar tree in Pune university campus.. today morning with Pune Urban Sketchers.